Slowly over the years I have added to my list of Caribbean islands that I have been lucky to visit and explore. Barbados has always been on the top of my "to-visit" list, so I was thrilled when I finally got the opportunity to go there. Here are three cool facts about Barbados that had me wanting to know more; 1) It is the most easterly Caribbean island, 2) It is an independent country built on a rich British and Caribbean culture, and 3) You are almost GUARANTEED to see a monkey here, probably in very close proximity. Barbados has a modern airport that makes traveling here easy with direct flights from popular cities including New York, Miami, London and Toronto. After arriving in Barbados we were headed to our villa at Sandy Lane Estates, so we had set up a car service to take us to the villa and our rental car would be delivered directly to the villa later in the day. 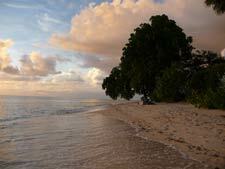 This is the recommended way of arrival unless you are already familiar with the island. Our driver had some secret shortcuts so we zipped through some of the more local neighborhoods and through the sugar cane fields which all made for a nice introduction to Barbados. At last we arrived at Villa RL GRE where we were buzzed through the gate and followed the driveway for our first glimpse of where we would be staying for the next 3 nights. This is a lovely villa made of coralstone with lush gardens that make it very private even though you are bordering the famous Sandy Lane golf course. We had a pleasant welcome from our cook Nancy and maid/laundress Amaria who took such good care of us during our visit. Barbadians have a natural friendliness about them that makes this island pleasurable to visit. The villa itself is a real find since it was recently renovated and the result is a very bright and comfortable interior. I had the best girly pink and green bedroom ever, I never wanted to leave. The pool at this villa is really large and great for laps. We were swimming at every chance we had. We were all excited to be staying at the Sandy Lane Estates which is a central location intermingling with the golf course and just 5 minutes to the beach. Oh, and did I mention that the monkeys love to hang out in this area? 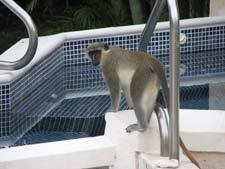 We had our first monkey sighting on the evening of our arrival as we were lounging on the veranda. I couldn't believe it when this creature emerged from behind the bushes just 12 feet from us! He looked at us and slowly walked by, unimpressed by my obvious awe. He then walked over to the Jacuzzi, looked back at us once, then hopped over and into the woods. Amazing, what a welcome to Barbados! Many of the estate houses, including ours, have cabanas at the beach adjoining the Sandy Lane hotel beach. This is a great asset to any house because it allows you to park at the beach and open up the cabana (a large storage closet) where beach chairs and other toys are stored. The staff there will set up all your stuff for you, and there are bathrooms and a fresh water shower to rinse off in. The swimming is great right there as well. And if you are really lucky, as I was, Bongo Man will be strolling the beach selling foot massages.